The level 46+ version of Chillrend has the highest base damage of any one-handed sword in vanilla Skyrim. 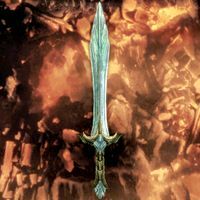 The heavier dragonbone sword from Dawnguard equals its base damage, while only the 60+ version of Miraak's Sword from Dragonborn surpasses it. Chillrend also appeared in Oblivion with a similar enchantment as a reward for successfully completing the quest The Killing Field. The frost damage effect on Chillrend is affected by the Augmented Frost perks in the Destruction perk tree and will raise to 37 with the first, and 45 with the second perk. Unlike ordinary frost damage enchantments, Chillrend's frost damage does not damage the target's stamina. For more information, see the lore article.